Diesel Techs are in high demand and with valuable skills, doors open for them at a variety of employers. We think all qualified diesel technicians should come work for our team but rather than take our word for it, we consulted one of our own to give us his thoughts on what it is really like to spend your day working for TeamFNW. Technicians who come to work for TeamFNW get access to state of the art tooling and diagnostic equipment, with factory training available to keep your skills sharp. That focus on training and equipment is a big reason why being a tech for Freightliner Northwest really helps develop someone’s career. It’s never the same day twice. 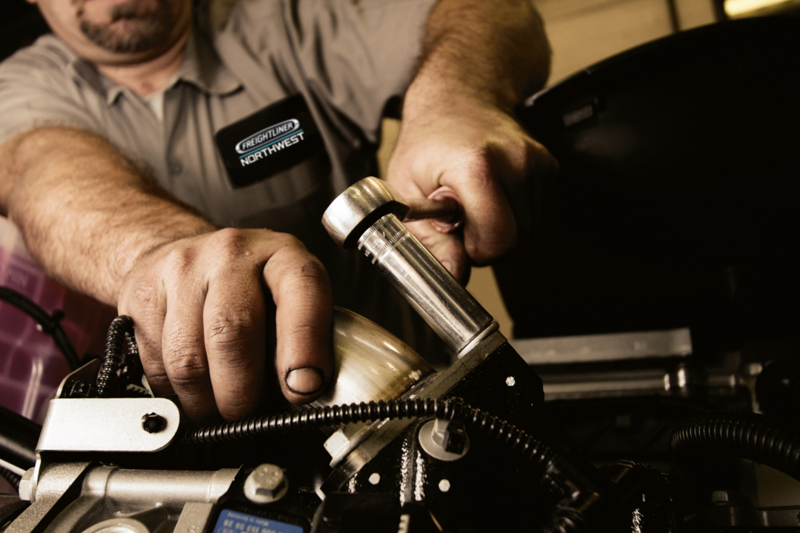 Our technicians can change a customer’s bad day into a good day when the job is done. That is one of the great things about being a diesel tech. We also get the satisfaction of taking something broken, diagnosing it and then fixing it. We get to work on different kinds of equipment so there are lots of opportunities to learn and try something new. We have a team spirit in the service department and we get to tap into the knowledge of our fellow technicians when we need help. I also really appreciate the company’s focus on safety as well as putting the needs of the customer first. One thing that really sets us apart is Freightliner Northwest’s commitment to helping every tech find their strengths and developing any areas they want to improve so they can take on more complicated jobs and become a master tech. We’ve also had techs decide to take on management roles in the company. Click here to check out our career opportunities and find out for yourself why working for Freightliner Northwest is a great decision. Built upon over 30 years of helping customers satisfy their transportation needs, Gordon Truck Centers, Inc. is an expanded network of dealerships doing business as Freightliner Northwest, Western Star Northwest, and Freightliner of Hawaii. The Dealership Family has 12 locations located off nearly every major highway throughout Washington, Oregon and Hawaii. As a full-service Freightliner, Western Star, Fuso, Wilson Trailer, Reitnouer Aluminum Trailer dealership family, GTC can sell, finance, insure and service commercial trucks for medium and heavy-duty applications.